Edit note: We had some sound issues on the podcast with Kevin and I because of some radio interference with the mic as we recorded on site. They occur at 5:30, 6:30, 9:10, 17:17-17:34 and then from 17:45 to about 18:18. Next week we won’t be on the road and we figured out the cause so it won’t happen again when we are. Apologies. This week in the podcast we took on two intractable problems: voice control of the smart home and International CES. First up, Kevin Tofel and I hit up the first day of CES and discussed some of the news we heard and products we’ve seen. Among the highlights were a connected coffee maker for $199 from Smarter that grinds your beans before it brews and a full color, Bluetooth connected LED light for $29 from a French company called BeeWi. 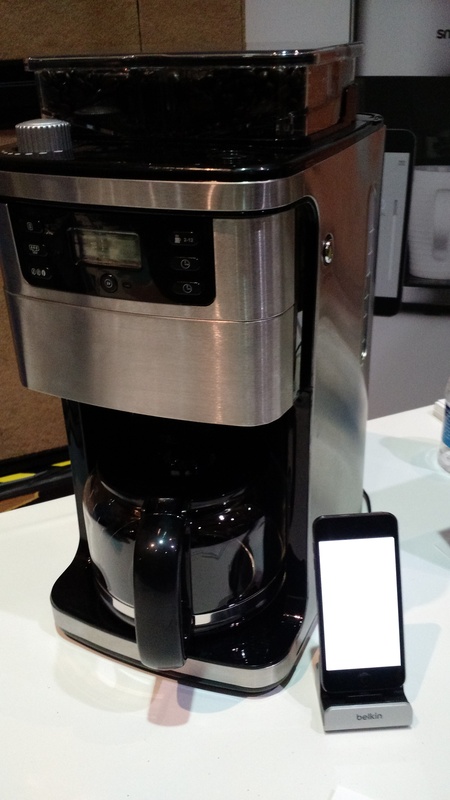 The Smarter connected coffee pot. Kevin and I discuss many more products and things that we’ve seen, and you can expect more from our time later this week on the show floor and after notable keynotes that we didn’t have time to hear before we recorded the show — notably Samsung’s where it discussed its plans for SmartThings. But there’s plenty to listen to before we head into our guest who is Leor Grebler the CEO of the Unified Computer Intelligence Corp, which makes the Ubi. Regular listeners will be familiar with the Ubi, a computer that tries to be a home version of Siri or Google’s voice recognition service for the home. While Ubi needs work, Grebler came on the show to discuss the future of voice interaction in the home, Amazon’s Echo and how to build a business pushing a technology that the market may not be ready for yet. I hope you enjoy. Guests: Leor Grebler, Co-founder and CEO of the Unified Computer Intelligence Corp.